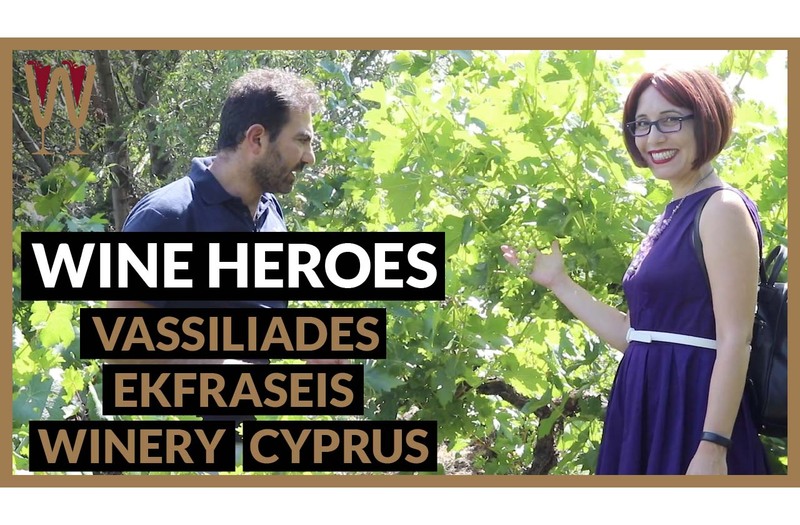 Vassiliades Ekfraseis Winery makes Cyprus Wine and is based in Chandria Village in Cyprus (Οινοποιείο Εκφράσεις Βασιλειάδ in Greek). At an altitude of 1230m we had an ear-popping day at the winery, visiting Christos Vassiliades and his tasting room, and walking through his vineyard and his vines. It was a great visit, and stick around for the end of the video where we taste and rate three special bottles of wine. A Xynisteri white wine, a Mavro rosé wine and a summery red Mavro. So, I have just had the most fascinating visit with a wine maker who is really a romantic figure, a rebel, a poet. I have just been talking to Christos Vassiliades of Vassiliades Ekfraseis Winery. The man has a vision. He believes in his terroir, and with good reason. Christos has some of the highest vineyards in the whole of Europe. He is determined to put Cyprus on the map. And, he is not going to accept the comfort of the indigenous variety making him distinct, he wants to go for international varieties and prove that the terroir in Cyprus can show off international varieties such as Sauvignon Blanc, such as Pinot Noir, and meet international wines an an equal and excel and do better. The Vassiliades Ekfraseis Winery is located on the Pitsilia Wine Route, in the Limassol region of Cyprus. It is based in Chandria village, 12 hundred meters above sea level. Chandria is the second highest village on this mountain, and has a permanent population of only 220 people. Imagine my surprise to be invited to this sleepy little village to chat about one of the newest wine projects on the island. The first thing that struck me when I met Christos Vassiliades was his intensity. Words were pouring out of him in torrents. And every statement was a definite, uncompromising pronouncement. Yet, I liked him instantly. There is a vulnerability behind the bravado. He is proud, he is knowledgeable and he is passionate about wine and elegant winemaking. The physical isolation that the rugged terroir of the Madari hills has imposed on Christos comes at a price. Christos is completely out of sync with every other winemaker on the island. His vineyards are so high up that harvest time for him comes many weeks after everybody else has moved to vinification. In fact, his highest vineyard isn’t ready for harvest till December! His nervous energy was contagious. Rather than immediately proceed with the tasting of his wines we abandoned the tasting room and took our discussion outside. When we stepped outside, Christos pointed at the wall behind the tasting room and asked: Do you see that? Do I see what? He explained. The Troodos mountain range is composed entirely of oceanic crust that was pushed up when the African and Eurasian tectonic plates collided millions of years ago. The rocks used to build the wall he was pointing at, were once at the bottom of this prehistoric ocean. In fact, it is no exaggeration to say that the higher one climbs on Troodos mountains, the deeper into the primordial ocean one dives – with marine fossils testifying to that effect. And this is the ground all of Christos’s vines have to battle with for nutrients. And why should you care, you ask. One word: Terroir! Terroir refers to the natural environment in which a wine is produced. It includes factors such as the soil, the climate and the elevation. Drawing nutrients from a rocky soil that used to be buried at the bottom of an ancient ocean is unique enough, but the vineyards of the Vassiliades Ekfraseis Winery are also amongst some of the highest in Europe, if not the world. Christos’s Sauvignon Blanc vineyard sits at a breathtaking 14-hundred metres above sea level. His Pinot Noir vines, at 13-hundred metres above sea level. Sauvignon Blanc and Pinot Noir are, of course, grape varieties commonly grown in France, not Cyprus. This was a specific choice by Christos Vassiliades. The peak of Madari can be warm and bright but is also beaten by rain, blanketed in snow and smothered in perpetual early morning fogs. Actually, does this sound like a French wine region to you? Mr Vassiliades selected grapes that matched the terroir, rather than try to force indigenous varieties to brave the weather. Christos is also intimately aware of the microclimate of every vineyard he owns. Because of the variable geography of the Madari hills, each vineyard is exposed to unique climatic conditions. Depending on its slope gradient, aspect and elevation, each vineyard enjoys a different exposure to wind, rainfall, humidity and frost. Mr Vassiliades takes all of these factors into account before making any decision specific to a particular vineyard. I was given some amazing facts. At this altitude, a hectare of vines will produce 300 kilos of grapes. For comparison, a hectare of vines in the valleys could produce eight-times that amount. In fact his best loved and highest plantation, inherited from his grandfather, sits at an altitude of 15-hundred metres. It is home to Xynisteri vines so old and so distressed that they barely produce 80 kilos of grapes per hectare! We further discussed that these small yields mean that the 5* hotels and restaurants that eagerly stock his wines keep running out and he is not in a position to simply provide them with extra bottles. In theory, that just makes his wine more desirable, but the possibility that one of these venues might decide to no longer stock his wines, because of this limited supply, is a real danger that is never far from his thoughts. I experienced the frustration of these shortages first hand. His Sauvignon Blanc and his Pinot Noir were available to sample in the tasting room, but no bottles were available for us to buy. Christos invited me to walk through his vineyards with him. This Chandria village vineyard was also inherited from his grandfather. Watching him move through his goblet shaped vines served to emphasise his connection to every plant. Every single job needs to be performed manually, including carrying harvesting baskets overflowing with grapes up and down the treacherous slopes. And Christos is indeed very hands-on in his approach. He pointed out to us that his grapes were at a far earlier stage of maturation compared to grapes in the sun-drenched valleys. The berries were smaller, the skins were thicker, even the leaves were tougher to the touch. The vineyard is densely and randomly planted with chest-high goblet vines. Furthermore, the thought of planting in neat rows so grape harvesters could drive through them never occurred to Christos’s grandfather and it’s not an option available to him either. We chatted for another twenty minutes amongst the fruit and then it was time to make our way back down the mountain. Wow! My ears popped! We have just descended 1200 metres in 90 minutes. We are back in Larnaca, we have brought two bottles from the winery, and we have found a third Vassiliades Ekfraseis bottle in a supermarket on the way. Yes, we tasted most of the labels in Chandria earlier this afternoon. But I’m afraid the video footage is overexposed. It was 2 o’clock in the afternoon, in July. Let’s do that tasting again, shall we? This time in a situation where we can control the lighting a bit. We respect you tasters too much to show you bad footage. You need to see what we are so excited about. So we have three bottles of Vassiliades Ekfraseis dry wine, the Xynisteri white, the Mavro rosé, and the pale, light-bodied Mavro red wine. All three of these labels are perfect summer wines! Let’s taste them! The 2017 Vassiliades Ekfraseis Xynisteri is a 100 per cent varietal bottle. On the nose, this wine is redolent with aromas of holiday jasmine, under-ripe pear, green apple and new lemons. In the glass, this wine is crystal clear, it is the colour of pale straw, and it looks as bright as it tastes. On the first sip, you will find tastes of fresh parsley and grass, not like Wimbledon lawn, but the long grass you crush under your feet when you walk through the fields of a mountain village. At 12.5 per cent Alcohol, it is light bodied but somehow still coats the tongue with its rich texture. This wine has a refreshing acidity and minerality which makes it very food-friendly. As a pairing I would recommend a prawn salad. It will love the dark leafy greens. This 2017 medium dry rosé by Vassiliades is made entirely of Mavro grapes. On the nose, this wine bursts with aromas of strawberries and cherries. In the glass, it shimmers like a pink rhinestone, promising crystal-coolness and freshness. On the first sip, the mild sweetness amplifies all the fruit but there is plenty of acidity to balance everything out. I love the intriguing aftertaste of kirsch flavoured bonbons. At 13 per cent alcohol this is a fuller bodied rosé than I anticipated. As a pairing I would recommend a pasta salad with tangy goat cheese and aromatic sundried tomatoes. Finally, this Vassiliades Mavro is not like any other Mavro that I have experienced. On the nose, it is overflowing with aromas of summer berries, violets and lilies. In the glass it twinkles like a ruby stone, promising thirst-quenching coolness. On the first sip, you will find roses and strawberries, and a quaint echo from my childhood, rose cordial topped with iced water. At 13.5% it’s medium bodied but tastes lighter because it is free of the brazing tannins one usually expects from Cypriot reds. Instead, this is a summer red, It is light enough to serve straight out of the fridge – and when you live on an island like Cyprus where summer lasts at least 9 months, this is not a small point. As a pairing I would suggest that Cypriot classic, pork souvlaki in a pita that is overstuffed with a tomato, cucumber, onion and parsley salad and crowned with a drizzle of light tahini sauce. This is an unfinished story. Vassiliades Ekfraseis is a young winery that is looking to establish its identity. It is carried exclusively on the shoulders of a single man: Christos Vassiliades. And what defines Mr Vassiliades is his need for balance. He looks for balance in the terroir he is working with and in the wine he creates. And his mantra is simple: “A good wine is a balanced wine.” Having visited him and his winery and having tasted the wine, now, finally, the name of the winery makes sense. Ekfraseis is the Greek word for expressions. Each bottle he creates is an expression of the Troodos mountain range: ear-popping altitude, low atmospheric pressure, temperature extremes. And the minerals, metals and fossils of the ocean floor that one day reached for the sky.